If y'all haven't figured it out by now, we're kinda into our elopements! And apparently y'all are into them, too, because we're asked about them every single day. 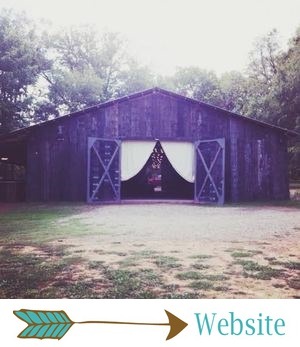 No one does elopements quite like The Barn - they're incredibly romantic and full of the most beautiful details! If you want all the details on our super popular elopement collection, read this post. Jennifer and Troy eloped at The Barn last fall, and their wedding had the prettiest purple details - including a purple bridal gown, which we're still obsessing over! These photos by one of our favorites, Erin Wilson Photography, are beyond dreamy! Get ready for some major swoonage! Jennifer and Troy were married at The Barn at Twin Oaks Ranch in November 2017. Their wedding was full of rustic chic details and loads of pretty purple. The prettiest purple detail was Jennifer's dress! We LOVE a unique bridal gown, and this one was stunning. We also loved her accessories - the prettiest belt, a gorgeous hair piece, and a great pair of boots. Jennifer, you are such a beauty! Jennifer's bouquet and florals were sooo insanely pretty. They included a mixture of purple and white roses, succulents, scabiosa pods, and a mixture of greenery. All of the texture in her bouquet made it perfect for a rustic wedding! Jennifer and Troy's ceremony was full of rustic details and pretty purple florals. 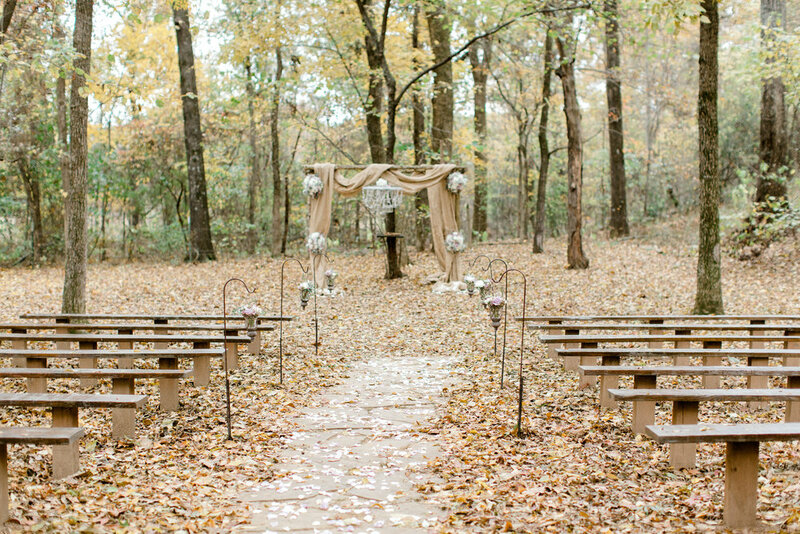 Their altar was draped with burlap (like, COVERED in burlap, y'all) and also included four white and purple floral arrangements - this is always one of our favorite altar styles! They also had a fabulous mason jar chandelier hanging from their altar and wire sconces full of flowers lining their aisle. Their guestbook table details were super sweet - florals and the sweetest burlap and lace streamer wands for their guests to wave as they walked back down the aisle as husband and wife! Elopement ceremonies are always intimate and romantic. 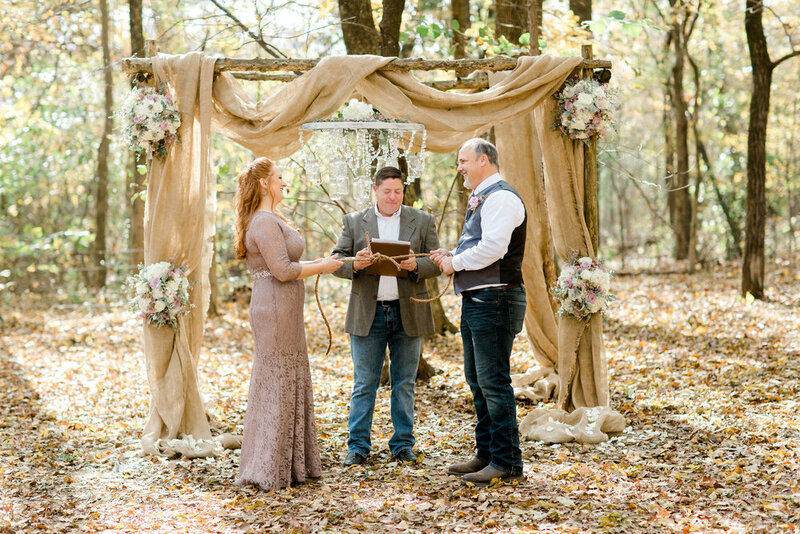 Some of our elopement couples choose to say their I do's with only an officiant and a photographer present, but Jennifer and Troy shared their ceremony with their closest family, friends, and their children. One of the most special moments was their unity ceremony, in which they literally tied the knot! They also walked back down the aisle with their cute kids, which was the most perfect way for this sweet family to begin their new life together. Erin's portraits are always stunning, and these are just the prettiest. 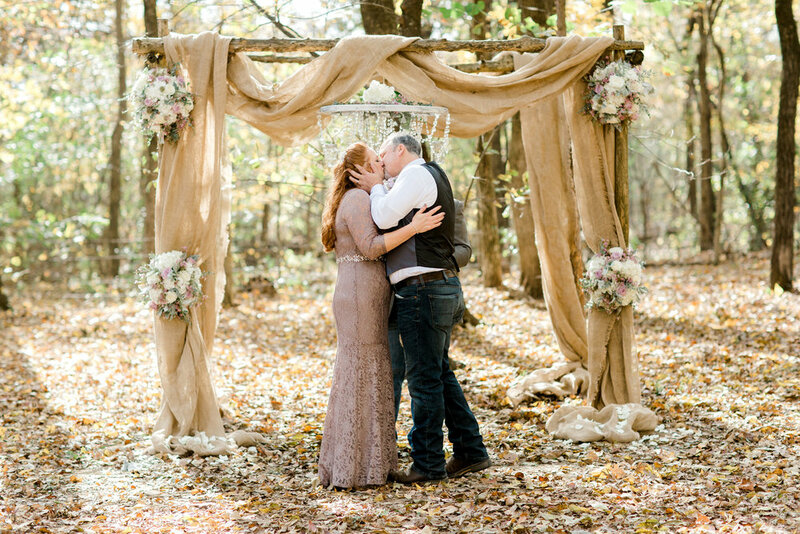 One of the BEST things about eloping at The Barn is that our couples are able to have the small, intimate wedding they're hoping for, but they also get GORGEOUS pictures like these! If you want to elope but you also want the gorgeous pictures of a "traditional" wedding, our elopement collection is for you! Elopements at The Barn include a cake cutting, with the prettiest cake and cake table set-up you've ever seen. 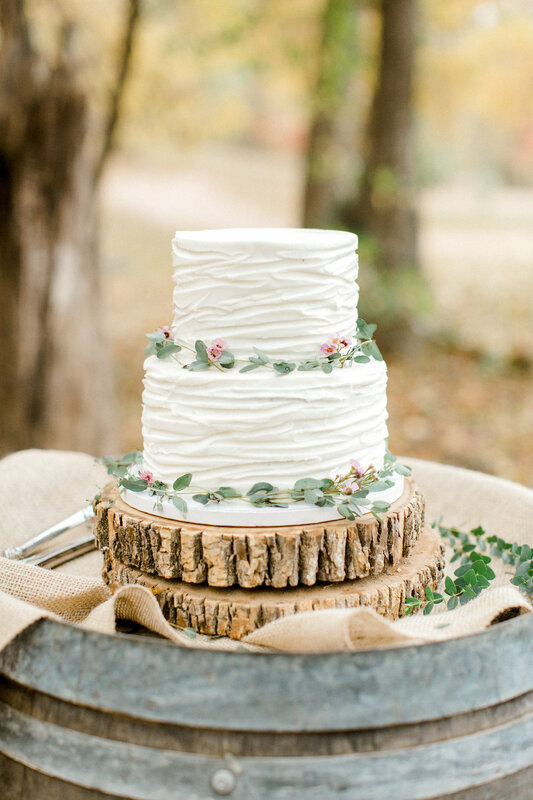 Jennifer and Troy's cake was a simple, rustic white cake with a touch of greenery and flowers. Stacked vintage crates and a vintage barrel made the perfect cake table for a rustic wedding!